If your organization has invested money in building a mobile app for your users, you’ll definitely want to test it to make sure it’s well-designed and easy to use. New remote technologies have made mobile user testing for websites practically as easy as desktop testing, but mobile apps can still be tricky (especially on iOS). This article will describe some tips and workarounds for testing mobile app designs with TryMyUI when your situation doesn’t quite match our default testing formats. For Android, you can test any live app by selecting “Mobile app” for interface type and “Android phone” for device type, then entering the Play Store URL where your app can be found. Keep in mind that this method only works for live apps available in the Play Store. Any non-Play Store URL will cause the test to not work. For testing iOS apps, the option we currently have is our user testing SDK: a software kit you can add to your own app to include TryMyUI’s mobile testing functionalities directly within it. The SDK is available on the Team and Enterprise plans. 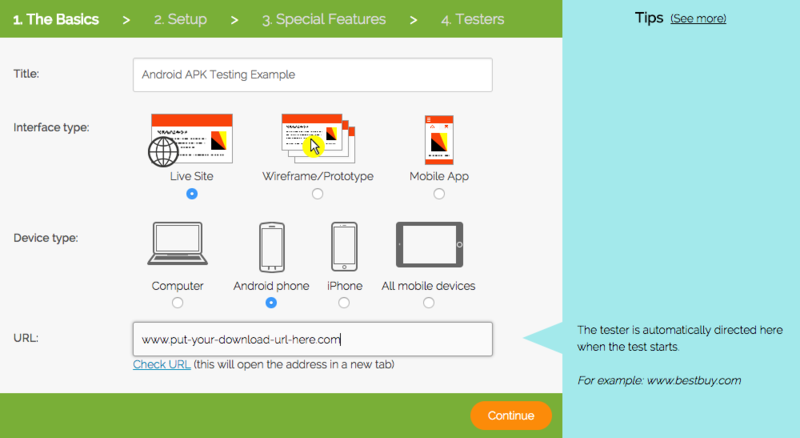 There are a few other ways you can test your app UI designs with TryMyUI outside of the circumstances mentioned above. If your Android app isn’t live in the Play Store yet, you can still test the APK. During setup, choose “Live site” instead of “Mobile app” for the interface type. Then, you can provide the download link for your APK as the starting URL for the test. When the test begins, users will go directly to the download link. After they’ve downloaded and installed the APK, they can test it just like a live app. 1. Scenario: In addition to the regular scenario text that provides users with the proper context and mindset, make a note that they will be testing an unreleased version of an app, and that the test will begin with downloading and installing it. 2. Tasks: Your first task (or few tasks) should just be instructions to help the testers get the APK set up on their device. Tell them what they need to do, using specific details if necessary. Remember that the testers may not know how to do this. After that, write the tasks you want users to perform in the app interface itself. 3. Demographic Special Requirements: In the Special Requirements box during the tester demographics step, include a note that testers will have to download an app file for the test. Some testers may not be willing to make downloads for a test, so this will filter them out. While you can’t test live iOS apps without using the SDK, you can still get feedback on your iOS app’s design by testing a prototype of your app. Your prototype must be hosted somewhere with an accessible URL. Online services like InVision and other similar platforms are great for testing mobile prototypes with TryMyUI. 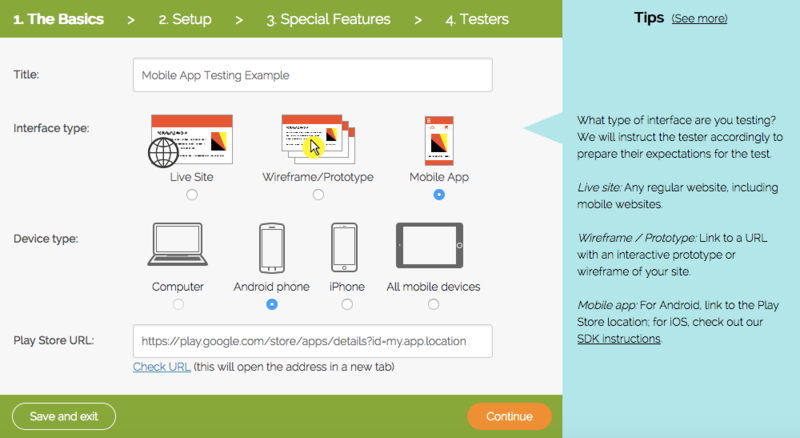 Set up your test, choosing “Wireframe/Prototype” as the interface type and “iPhone” as the device type. Then, paste the link where testers can view your prototype into the URL field. On their phones, testers will see and experience your mobile prototypes in a way similar to a live app. Make sure when you write your tasks to provide any special instructions necessary for interacting with the prototype. All of these tips, of course, also apply to testing Android app prototypes. Please take advantage of these workarounds to get usability feedback for your Android APKs and iOS app prototypes.